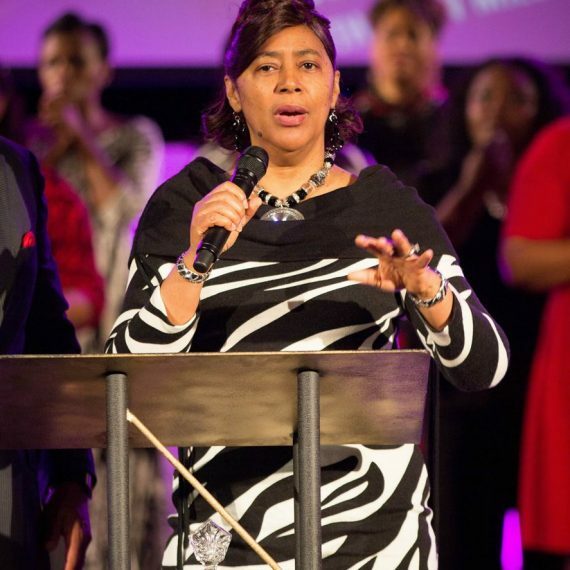 Lady Narlene is currently the Chief Administrative and Operations Officer for the overall ministry of the Potter's House which includes the aforementioned responsibilities of the church, as well as pro- viding oversight for the church-owned entities which include: Kingdom Plaza Mall, The Soul Food Bistro, King Pins Bowling Center, Temple Builders Fitness and The Potter’s House Christian Academy. Lady Narlene has served on the Board of Directors for numerous organizations, including Logos Bible College, School of Success Charter School and SISTERS OICU, Inc., a prison release program for women. Lady Narlene McLaughlin married her husband, Vaughn McLaughlin in June of 1978 and they have now been married for over 30 years but the most important date in her life was when she accepted The Lord Jesus Christ and was born again in September of 1982. Ever since that day Lady Narlene has devoted her life to Christian service and has earnestly tried to live a consistent Spirit-filled life in Christ ever since. Lady Narlene’s faith and devotion to God was put to the test shortly after her husband began pastoring in 1987. In August of 1988, Lady Narlene heard the Lord and took an enormous leap of faith and left her job as Operations Manager with American Heritage Life Insurance Company to work with him in full-time ministry as they founded what is now The Potter’s House International Ministries. Was founding Principal and served as Administrator of our once 500 student Christian Academy for 10 years; also taught Psychology to senior students. Presently serve as Chief Administrative Officer of The Potter’s House Christian Fellowship, Inc., assisting the Bishop in all of the administrative and corporate duties of the ministry; including overseeing staffing (presently over 160 full and part time), personnel benefits, facility acquisition and maintenance, construction management, budgeting, accounting and stewardship, marketing, ministries operations, etc. 1970-1974 – Germantown High School, Germantown, Tennessee with a major concentration English and Biology. 1974-1978 – B.S. Degree in Psychology from the University of Tennessee, Martin, Tennessee. and Basic Principles of Life Insurance. 1992-1994 – Logos Christian College. 9 credit hours in Biblical Studies. Pensacola Christian College, Pensacola, Florida. Lady Narlene is currently the Chief Administrative and Operations Officer for the overall ministry of the Potter’s House which includes the aforementioned responsibilities of the church, as well as pro- viding oversight for the church-owned entities which include: Kingdom Plaza Mall, The Soul Food Bistro, King Pins Bowling Center, Temple Builders Fitness and The Potter’s House Christian Academy. Lady Narlene has served on the Board of Directors for numerous organizations, including Logos Bible College, School of Success Charter School and SISTERS OICU, Inc., a prison release program for women. Lady Narlene and Bishop McLaughlin have, by God’s grace, reared two beautiful children (now grown), Angel and Stephen.